It's Easter weekend, and time to enjoy chocolate Easter Bunnies... adult style! Remember the joy of chocolate Easter bunnies? You may have been buying chocolate Easter bunnies for your kids and grandkids for decades now.. but maybe it is time to treat yourself! While the kids and grandkids are rummaging for hidden eggs or plowing through overloaded Easter baskets, you can enjoy some adult Easter treats left by the Pooka just for you and the other adults in the room. After a busy day of Easter baskets, Easter dinner, and kids charged up on chocolate, sugar, and excitement, you need a treat. 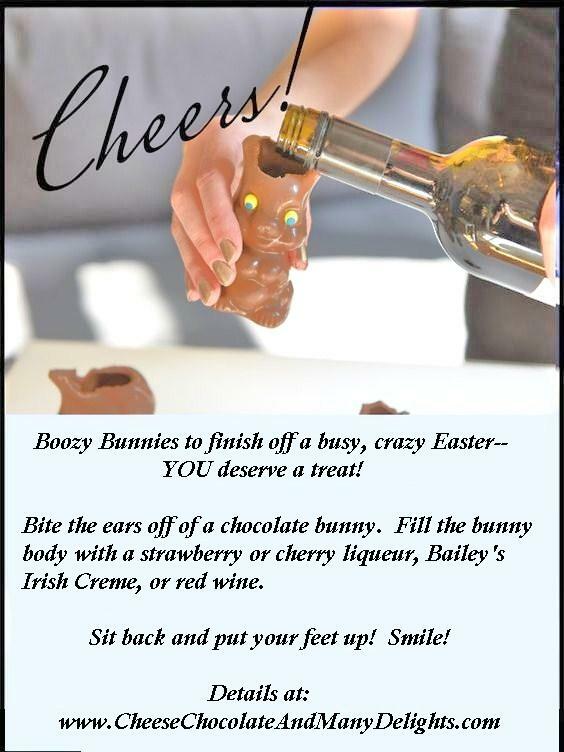 Let's try the easy version first: Boozy Bunnies loaded with liqueur. I found versions of this recipe on several sites around the Internet; first a shout out to Two Drunk Ladies, with both a Facebook page and a great site through which you can buy drinking glasses and related items. And another shout out to someone named Ann Hasted at Pinterest. 1. Buy a hollow good quality chocolate bunny (milk or dark, whichever your preference) for each adult in the party. Double-check that the bunny is hollow before you get them home and find they don't work.. Then you'd have to give them to the kids to nibble on and we wouldn't want that. These bunnies are for YOU. Lindt chocolate bunnies seem to be a favorite. a. Give a bunny to each adult Easter fan (after dinner works best, but some may wish to get a head start on the festivities) and let them bite off the ears. Or b. Carefully cut the ears off the bunnies with a sharp paring knife. You may wish to heat that paring knife so that it cuts through the bunny ears like softened butter. In either case, pop those bunnies in the feezer for a half an hour or so after their ears make the cut. If you like the flavor of a cherry-filled-chocolate, try Heering Danish Cherry brandy, "The Daddy of Cherry Liqueurs"
"Heering Cherry Liqueur contains only natural ingredients including Danish grown cherries. No additives or artificial colouring. Swirl with ice, lean back and chill. Heering Cherry Liqueur is the original "Cherry Brandy." Contains nuts. Since 1818, Heering Cherry Liqueur has been a fashion accessory, adding extravagance and civilization to the mix of some of the most legendary cocktails of all time, including the original Singapore Sling." "The daddy of cherry brandies, made to a recipe dating from 1818 and matured for three years before bottling. One of the original ingredients in the first Singapore Sling created at the Raffles Hotel." I can't believe I made it to age 65 without ever hearing of Heering or his Heering Cherry Liqueur. You might be more of a strawberries-dipped-in-chocolate person, in which case you might want to fill your bunny with Tequila Rose Chocolate Strawberry Creme Liqueur. If you are the host, you may wish to provide several of these top-notch alcoholic beverages and let your guests choose! If they throw back the shots fairly quickly, they can reuse the bunnies. But it would be best if they threw the bunnies back into the freezer for a half an hour or so between shots... Otherwise, the chocolate will start to melt. And then onto Boozy Bunny Jello Shots (under construction)....Or maybe save that one for the next Easter.